Garmin echo 200: I thought I would do a Review of different manufacturers of Fish finders just so we could compare a few different ones. What I was a little surprised at was the lack of Information for the Garmin Fish finders. I had to do a lot of searching to find out the statistics, I needed to know to be able to give a good review. After a lot of time researching The Garmin echo 200, I feel this is a very good review with enough Information to let you make a good decision on whether it is something you would be Interested in purchasing. What Smooth Scaling Technology does is allows you to view sonar history as the depth ranges change. If you’re moving along and pass something that catches your eye but you just didn’t catch it in time, have no fear. Rewind sonar history allows you to go back and view the sonar picture from where you were previously. 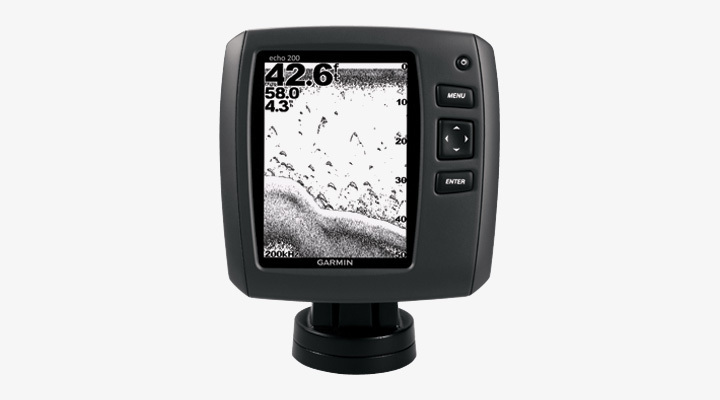 Garmin echo 200 is one of the most intuitive fishfinders on the market. Installation takes only a few minutes using the quick-release tilt mount and versatile transom-mount transducer included in the box. Connection to the transducer… If the transducer connection is not pushed into the quick release housing enough it will continually show in Demo mode. Just have to make sure the connection is pushed all the way in. It is recommended to use a soft cloth and mild household detergent to clean a transducer. If the fouling is severe, remove the growth with a green, Scotch Brite pad. Be careful to avoid scratching the transducer’s face. One person hears a clicking noise from his Transducer and that is actually the sonar pulse being transmitted from the transducer. If the transducer is being used in an aluminum boat, the noise can be amplified, depending on how it is mounted. To reduce the noise, try placing a wedge of neoprene between the transom mount transducer and the hull.